A 12-year-old asymptomatic boy was referred for assessment with a history of a heart murmur noted at 2 years of age but subsequently lost to follow-up. Physical examination showed normal growth and development and an unremarkable cardiorespiratory exam. He had participated in multiple sports with no shortness of breath, chest pain, or syncope. An echocardiogram showed lack of bifurcation of the main pulmonary artery with smooth continuation into the right pulmonary artery (RPA), mild hypoplasia of left pulmonary artery (LPA) measuring 7 mm in diameter, normal caliber of RPA (20 mm diameter), and no intracardiac defects. 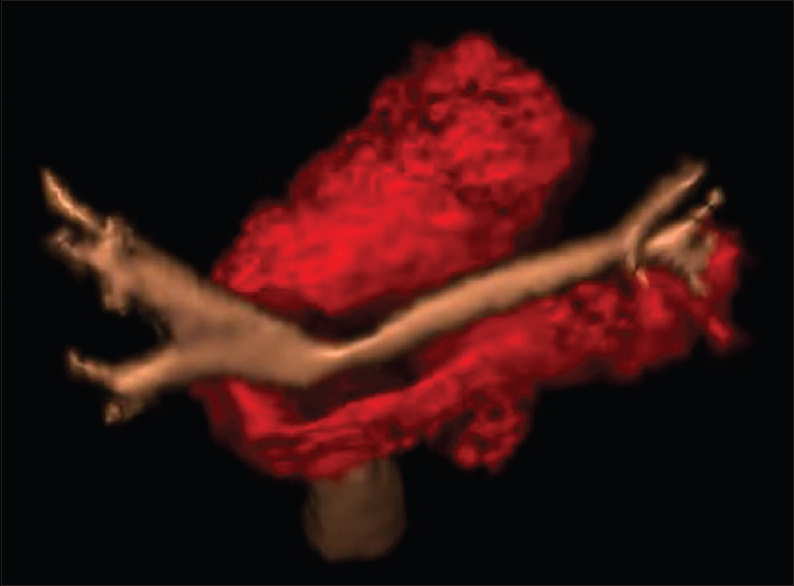 There was no obvious gradient across the pulmonary artery (PA) branches [Figure 1]. The predicted right ventricular systolic pressure based on the tricuspid regurgitation jet was normal; the predicted PA end diastolic pressure based on the mild pulmonary insufficiency jet was normal and he had normal biventricular function. 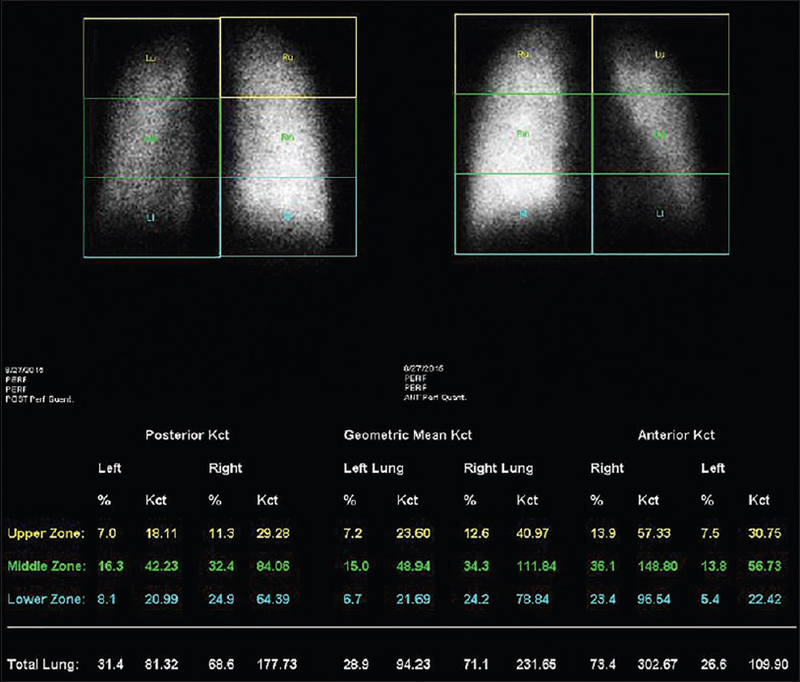 A Technetium-99m macroaggregated albumin scintigraphy with single-photon emission computed tomography (CT) acquisition revealed mildly asymmetric flow to the LPA (29%) and the RPA (71%) with no peripheral perfusion defects [Figure 2]. Chest CT with intravenous contrast including awake dynamic airway imaging during inspiration and expiration showed normal aortic arch with no evidence of tracheobronchomalacia or tracheobronchial compression [Figure 3]. Additional finding on the echocardiogram was the LPA making a hairpin turn after its origin and its posterior course toward the left hilum revealing the diagnosis of LPA sling. 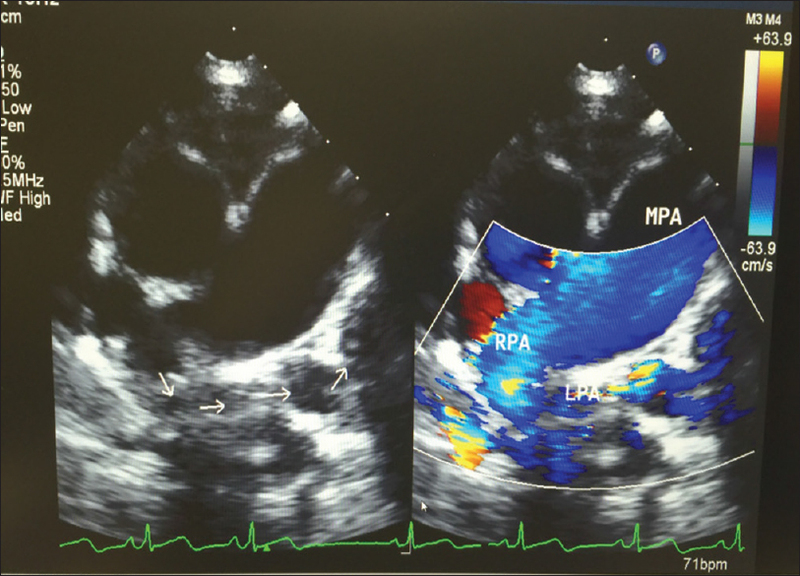 Echocardiographic differentials of an absent LPA include - LPA atresia, anomalous origin of LPA from RPA, ductal origin of the LPA, and anomalous origin of LPA from ascending aorta (Hemitruncus). Clockwise rotation of the transducer in parasternal short-axis view to longitudinally open up the RPA and a slight superior “tilt” helps to confirm this rare anomaly as the takeoff of the LPA is usually posterosuperior from the RPA. A clinical decision was made to follow-up closely through his adolescent age without surgical repair. Anomalous origin of the LPA from the RPA, also called as PA sling, is a rare vascular abnormality associated with other congenital heart defects and tracheobronchial compression. Majority (about 90%) of patients with LPA sling present in infancy with respiratory symptoms of airway obstruction, spontaneous improvement is very uncommon, and surgical repair is the standard of care for symptomatic patients. However, the true incidence of asymptomatic vascular sling is not known, and surgical intervention may not be warranted unless asymmetric lung perfusion worsens on long-term follow-up. Significant tracheobronchomalacia is unlikely without respiratory symptoms in the presence of normal awake airway imaging. Fiore AC, Brown JW, Weber TR, Turrentine MW. Surgical treatment of pulmonary artery sling and tracheal stenosis. Ann Thorac Surg 2005;79:38-46. Collins RT 2nd, Weinberg PM, Ewing S, Fogel M. Images in cardiovascular medicine. Pulmonary artery sling in an asymptomatic 15-year-old boy. Circulation 2008;117:2403-6.